After my race on Saturday I laid around for a bit and then took my little cousin to the movies. I had told his mom I'd take him for a bit so we could play and she could have a little break. I decided I'd take him to the movies since I wasn't quite sure what else to do with a 3 1/2 year old boy. It was way too hot to go to the park or anything outside (over 100). Trevor didn't want to go with me but Scott decided he'd tag along. Which, I'm really glad he went because I forgot how busy a 3 1/2 year old is lol. 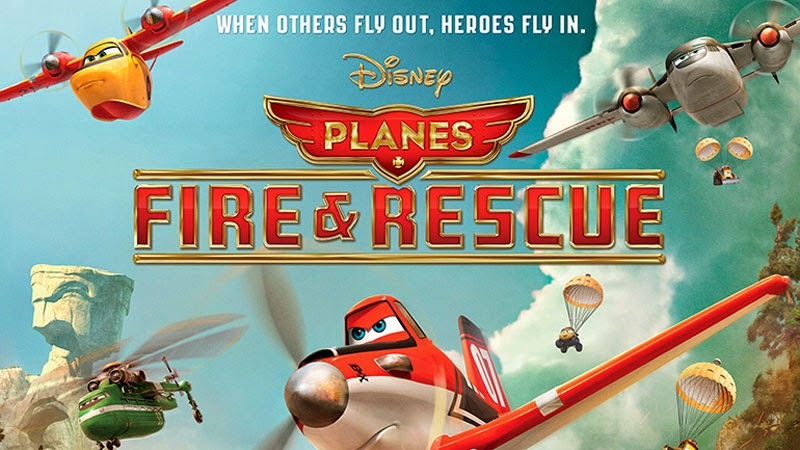 So I took him to see Planes: Fire Rescue. I haven't watched a Disney movie in forever and I can't even tell you the last kid's movie I saw in the theater without nodding off. The movie started at 4:35, which means really that the movie started at 5:01 (I checked when it actually started). So that's 26 minutes of sitting there before the movie even started. Which, is also like eternity for a little one. We had got popcorn even though he said he "didn't like popcorn". Then he ate like half the bag lol. I quickly realized "I don't like it" is just standard answer for every kind of food. Right after the movie started he told me he "didn't like this movie". I told him sorry but we paid for it so we have to watch itl. The whole movie was pretty lame and way above his head, I'm sure. I can't believe Disney makes such crap now. He did get pretty excited when the plane was actually flying in the movie and crashing. He yelled out a few things and people laughed in the audience. After the movie was over we walked out to check out the fountain. It was so bright outside his little light colored eyes were dying. This fountain is in the middle of a round about. It's a cool fountain but kind of hard to enjoy it when you're worried a kid is going to run out and get ran over ;) Plus, garbage in there. Let's trash everything people. He didn't want to go home yet so we brought him to my house. Trevor played with him the whole time and they got along great. I took him home around nine even though he "didn't want to go home". Little kids are a kick but it's nice just having them to "visit". Light coloured eyes and the bright sun ... I can relate to that! My eyes tear up too.